Though it was invented in the USA snowboarding has quickly become the fastest growing sport in the world. Most people tend to think that snowboarding is only practiced in places like North America and Europe, but in fact, there are mountains on every continent on Earth, and where ever there is snow there is snowboarding. In addition to good snow, more and more snowboarders are looking for a cultural experience from their trip, which means they are travelling to all corners of the earth to get their fix. The home of snowboarding, there are hundreds of ski resorts in the USA and Canada, where the sport continues to thrive. As well as the famous Rockies which run down from Canada into the States, there are many other less well known ranges that harbour ski resorts, such as the coastal mountains and the Appalachians which provide superb conditions and terrain for snowboarding. Most people know about the French, Austrian and Swiss Alps which are home to hundreds of excellent ski resorts, but the European continent offers many other less well know mountain ranges which are growing in popularity. Spain has the Pyrenees and the Sierra Nevada – a mountain range so close to the coast, you can go surfing after snowboarding. Norway, Sweden and Finland all have many ski resorts, and though their mountains tend to be smaller than in the rest of Europe, their northerly latitude means that they have lots of snow and a long winter season. Eastern European countries such as Bulgaria, Slovenia, Slovakia and Poland are becoming increasingly more popular with British snowboarders providing great value for money and an interesting cultural experience. Even places like Cyprus, Portugal, Greece and Turkey have ski resorts as well as beaches on offer! Both Chile and Argentina offer excellent snowboarding in the Andes and Bolivia is home to the highest ski resort on earth! 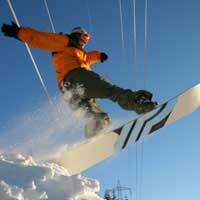 New Zealand is famous for its ski resorts with snowboarding available on both the North and South Island. Australia also has a number of small resorts offering unique terrain,with gum tree fringed slopes and there are even some ski areas on the island of Tasmania! Both Australasia and South America have their winters during the Northern hemisphere’s summers, so make a good destination for summer snowboarding. Many people will be surprised to hear that you can go snowboarding in Japan, China, India, South Korea, Kazakhstan and many other countries in Asia. Indeed, counties like China and South Korea are currently experiencing a ski boom as they reach new levels of wealth and skiing becomes affordable to more of the population. Japan has been known as a powder destination for many years and offers some of the deepest lightest snow on the planet in addition to an amazing cultural and culinary adventure. In the Middle East, Iran has a number of resorts as does Lebanon, and in Israel, Mount Hermon offers good sport to snowboarders. Most people think of Africa as a hot, dry continent, but there are several snow capped peaks there and even a number of permanent ski areas. Though these are very small compared to areas in North America and Europe, they never the less offer the chance of a unique snowboard “safari”, and are currently very cheap. South Africa, Morocco and Algeria all have ski areas with permanent mechanical uplift. So, when you’re planning your next trip, remember there are many, many mountains from which to choose. Why not try somewhere a little different next winter?